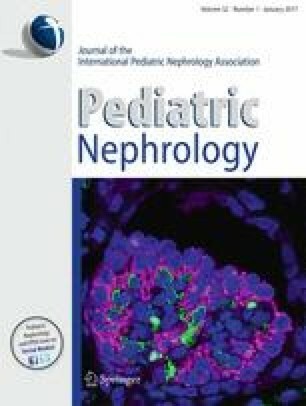 Serum cystatin C (CysC) is a more accurate glomerular filtration rate marker than serum creatinine (SCr) and may rise more quickly with acute kidney injury (AKI). We performed a prospective cohort study of 81 non-critically ill children during 110 aminoglycoside (AG) treatments. We calculated area under the curve (AUC) for CysC to diagnose SCr-defined AKI and predict persistent AKI. SCr-AKI definition was based on the Kidney Disease: Improving Global Outcomes (≥stage 1: ≥50 % or 26.5 μmol/l SCr rise from baseline; stage 2: SCr doubling); CysC-AKI was based on a modified version using CysC rise. SCr-AKI and CysC-AKI developed in 45 and 48 % treatments, respectively. CysC rise predicted stage 1 (AUC = 0.75, 95 % CI 0.60–0.90) and 2 (AUC = 0.85, 95 % CI 0.75–0.95) SCr-AKI 2 days before SCr-AKI attainment. The best combined sensitivity/specificity for percent CysC rise to predict stage 1 SCr-AKI was with a 44 % CysC rise (sensitivity = 65 %, specificity = 83 %). CysC rise on day of SCr-AKI development was associated with SCr-AKI ≥48 h (AUC = 0.73, 95 % CI 0.56–0.90) and ≥50 % persistent SCr rise at treatment end (AUC = 0.76, 95 % CI 0.61–0.90). CysC is as an early AKI biomarker and predictive of persistent AKI on aminoglycoside treatment. Dr. Zappitelli received institutional funding from the McGill University Health Centre Research Institute, the Kidney Research Scientist Core Education and National Training Program and the Fonds de Recherches en Santé du Québec to support this work. PD is supported by NIH grant P50 DK096418. Institutional ethics boards approved the study before initiation. All procedures performed in the study were in accordance with the ethical standards of the institutional research committee and with the 1964 Helsinki Declaration and its later amendments or comparable ethical standards. Informed consent/assent was obtained before participation.